Container spot rates from Asia to North Europe fell again this week and have now declined by 36% since the beginning of the year. The North Europe component of the Shanghai Containerized Freight Index (SCFI) slipped by 2.7% today to $640 per teu, suggesting that carriers will have difficulty implementing their planned 1 May FAK increases. Anecdotal reports to The Loadstar confirm that carriers have been obliged to discount already agreed rates in order to maintain bookings against a backdrop of disappointing forward booking prospects. However, there could be a boost for carriers in UK imports in the coming weeks, due to the further delay to the Brexit process. “With the new deadline for the end of Q3, there could be a last-minute spike in demand,” George Griffiths, editor, Global Container Freight Market, at S&P Global Platts, told The Loadstar today. Notwithstanding Ocean Alliance partners CMA CGM/APL, Cosco/OOCL and Evergreen pulling five Asia-North Europe sailings in weeks 17-21, the grouping has added to the overcapacity problem by choosing to introduce an additional seventh loop (NEU7) this month, deploying ten 13,000-14,000 teu Evergreen-operated vessels. The extra loop coincides with the alliance upsizing its NEU6 loop to the new industry norm of 20,000 teu vessels, from 14,000, and rival THE Alliance upgrading its FE5 loop by around 4,000 teu a week. 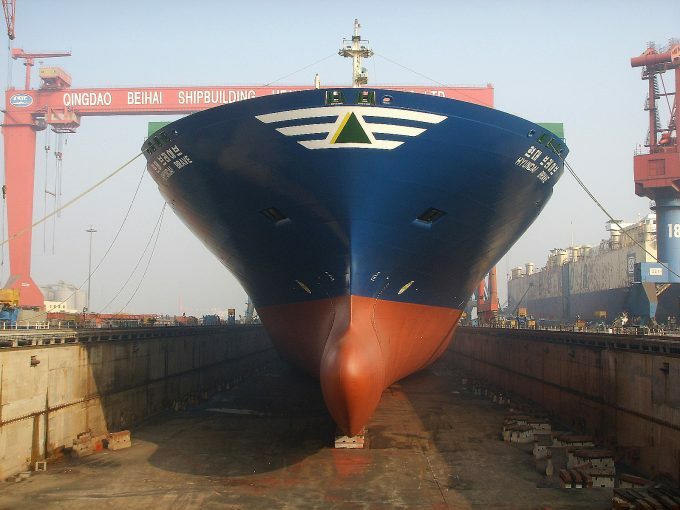 Moreover, HMM’s standalone AEX service is also being upgraded next month, by some 1,500 teu a week, with the phasing-in of larger, 6,800 teu, scrubber-fitted ships. The Loadstar has heard from several shippers that the South Korean carrier is stepping up its sales and marketing campaigns in Asia and North Europe ready for its 23,000 teu ULCVs that will be delivered from the middle of next year. And it is apparently telling customers it is prepared to operate the vessels outside of the alliances if necessary. Nonetheless, despite HMM’s optimism, these behemoths will be almost impossible to fill without the benefit of a VSA. Other carriers The Loadstar has spoken to recently say they expect HMM to remain as part of the 2M in some shape or capacity. Meanwhile, the SCFI recorded a slight uptick in spot rates to the Mediterranean, to $715 per teu. The tradelane has proved more robust than the North European route this year, albeit that rates have also lost about 28% since January. Elsewhere, it was a quiet week on the transpacific, with spot rates, as recorded by the SCFI, edging down 1% to the US west coast, to $1,606 per 40ft, and to east coast ports staying flat, at $2,638 per 40ft. After the success of their 1 April GRIs (the first successful price hike since mid-January), the prospects of transpacific carriers succeeding with a mid-April GRI look somewhat ambitious. “While space is currently reasonably tight and the new rates are still holding, another GRI is unlikely to stick without more blank sailings,” said Eytan Buchman, CMO of Freightos. There were further positive signals that the US-China trade talks were “moving forward” this week, thereby ending the stand-off between the two biggest economic powers that has shaken the world economic outlook. China’s commerce ministry spokesman, Gao Feng, said “new progress” had been made at the talks this week, adding that the two sets of negotiators remained in “close communications with all effective approaches”.